When the RNLI in St Helier, Jersey decided they needed a larger floating dock to keep their life saving Atlantic 85 launch dry when not in use, and with room to walk around it for maintenance, they called upon Marine IP for their VersaDock drive on platform solution. The VersaDock product used is one of the company’s Drive on Docks, which the heavy duty 8.5m RIB can drive straight onto in seconds, and most importantly, launch itself back into the water at lightning speed in an emergency. Marine IP designed the dock to have a two-part launch system, where the boat can be either in ‘standby’ at the back of the dock, or completely hauled out for maintenance. Even in this second position the boat can still be backed off the dock in a couple of minutes. VersaDock docks are made up of modular blocks so they are easy to formulate to the needs of the boat operation. 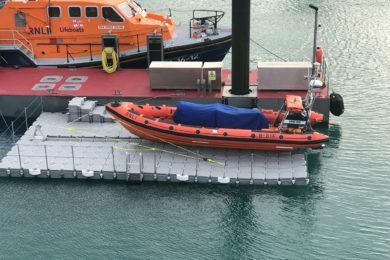 In this case the company specified the dock to be 11 floats wide so that the RNLI crew can move around the stable platform to clean the hull, carry out maintenance and load and remove casualties and equipment with ease. The lifeboat the David Page is one of two Atlantic 85 RIBs operated by the Jersey RNLI. The second is based at St Catherine’s and is launched from a boathouse. The Channel Island of Jersey is a busy area for leisure sailing and the lifeboats are kept busy assisting with both incidents at sea and around the island’s coastline.